Entering the town hall, which is a little worse for wear, we are directed up a huge curling staircase to the first floor. As we followed the spiral, we began to spot the signs and hoarding of old Limehouse restaurants and shops, growing denser till you enter the hall itself, where the monochrome signage provided the majority of the piece’s setting, along with a sturdy wooden bar at the hall’s far end. 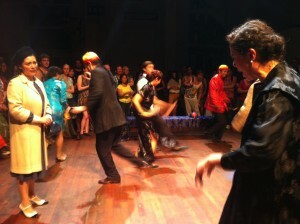 The production is performed with the audience mingling and moving around the setting, actors pushing through to perform their roles, before dashing off to their next act. To begin with, it could all very much be mistaken for a reception, the crowd of guests casually milling around. Yellow Earth’s productions always favour the unusual, and work with the space given. Stopping a little short of the “sandbox” given by promenade productions, soft sounds and lighting steer the audience’s attention. Low music, accompanied by the sound of typewriting, a chopping cleaver and the clash of pots and pans, set the opening scene. The bar becomes a kitchen, and actors in fifties attire emerge from the audience, some stroll across the floor, some calling, some singing. At the far end of the room, a group sit playing Mahjong. We are quite firmly placed in this miniature fifties “Limehouse”. The minutiae of detail is impressive. From the paper placemats at Friendship Noodles advertising its signature Lo Mein dish, to the wonderfully printed and bound copies of the fictional book written by one of the characters. The designer, Moi Tran, must either be a genius or psychotic. The story follows the returning Eileen Cunningham (Amanda Maud), who left Limehouse at the age of six, to live in America. Now, seeking a sense of belonging and heritage by rediscovering the once famous Ley-On Restaurant, opened by her now deceased father. When she arrives, she finds squalid conditions and a broken, disgruntled community eking out their last days in the Chinese ghetto, eager to move into the larger, cleaner accommodation offered by the council in return for the area’s demolition. Amongst the characters she meets are Johnny the chef of Friendship Noodles, his pregnant wife Iris, ex-ship’s cook Stanley and, the well-educated bourgeois organizer of the women’s clubs, who, despite having to make do with “a job in town and a bed sit in Earl’s Court”, is determined to get her parents out of the slums of Limehouse. The community in Limehouse is on the verge of dying. The staple customers of the restaurants, shops and schools, sailors docking on the Thames, had moved out to other parts of the country, prompting businesses to set up take-aways and laundries elsewhere. These are the second generation of immigrants, “integrated” into the new country, but losing their identity. Mrs Foong the Chinese teacher is appalled at how few Chinese children in Limehouse can actually speak Chinese. Despite the tragic state of affairs, and fuelled by the “authentic” taste of these “picaresque” slums, Mrs Cunningham sets about persuading, manipulating and exhorting the increasingly frustrated local residents to fight the council and preserve London’s original China Town. The story culminates at this town hall the play is set in, where the residents face the council regarding the future of their home. The overarching theme here is the conflict between irrepressible enthusiasm of Nostalgia, present in Mrs Cunningham’s attempted conservation of Limehouse (and her perceived heritage) for posterity, the realities of living and Limehouse residents’ anger at this newcomer’s interference. Tired of the poor sanitation and cramped spaces, they are desperate to provide a better future for their families, the very reason Eileen’s father took her to America in the first place. Progress and preservation, community and family interests, represented by the dynamic opposition between Mrs Cunningham and local, integrated, chef Johnny, is writ large. The sensitive Iris and outcast Stanley (Gaby Wong and Johnathan Chan), the only two characters who are sad to leave Limehouse, provide welcome variation from the overwhelming central conflict. Our main protagonist is the typical well-meaning American, who invariably gets it wrong. She treats the daily lives of the residents like ritual specimen rather than actual living, and wants preserve her Chinese heritage when she can’t even hold chopsticks. Despite all this, and probably a great deal due to Maud’s performance, I feel a huge amount of sympathy for her. Like many of the diaspora Chinese, she feels alienated in a country where she’s spent most of her life, and she saw the need for preserving heritage, long before any of those living in it, did. Chinese culture is still facing similar problems, where most of the Chinese inside and outside China are pre-occupied with securing individual financial futures, westernizing their children, and fitting in. Culture should “accumulate like layers of coral”, Cunningham tells the Limehouse Chinese, “we should all be aware of what came before us”. It seems to be either overseas Chinese or Westerners, like the creators of the Avatar animated series, or documentary makers who focus on China’s burgeoning indie scene, or stalwarts like Yellow Earth, who are showing people that it’s not enough to simply preserve China’s amazing cultural heritage, but how it can inspire new works. I suppose fish never think about water. I had a dreadful day preceding the show, the a rush to the venue and its lack of air conditioning put me in an even fouler mood, but so gripped was I, by the pace, the form, and the performance, I forgot my discomfort, eagerly looking for the next scene, and rushing there to secure a spot where my view wasn’t obscured by the taller guests. Writer Jeremy Tiang (Butterfly’s Wedding) has once again delivered a punchy and poignant script full of humour, and memorable lines. The immense energy which with the entire cast, especially Maud and Wong, gave the play the momentum needed to push it through the confusion and disorientation at each change of scene. It was great to hear both Mandarin and Cantonese spoken in the play, and also to see representation of issues usually depreciated, such as Chinese involvement in World War II this side of the pond, the history of the half-Chinese and closet Chinese homosexuality. 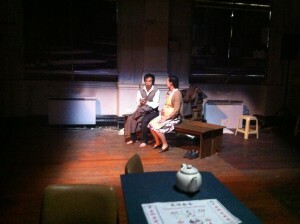 After the performance, members of the cast, some of whom are “Hun Xue” (mixed race), reminded me that there was legislation against Chinese women entering Britain at the time, so many Chinese men who settled here started families with locals; and that Shanghainese settlers tended to live in Pennyfields and Ming Street, whereas Cantonese settlers congregated in Limehouse Causeway. Although few of the cast have direct family history in Limehouse, I was impressed with how well informed they are on the area’s history. It was a pleasure to discuss, with Amanda Maud, her educational work at the British museum. Gabby Wong is also a published writer who tackles any subject that moves her. I also loved chatting about aspects of Chinese culture with Matthew Leonhart (Johnny Wong). It’s amazing to see a cast who all feel so powerfully about what they are representing. Whilst it is easier to depict any public scene in its quiet end than its wild heyday, the production did leave me thirsty for more of what life was like in Limehouse. Not just in the 50s, but also during the lion days of Limehouse. Perhaps this would balance out the grim impression of those residents happy to trade in their culture for a prefab. What were people’s daily routines? What was it like inside a Chinese laundry. What did the shops sell? In short, what was there in Limehouse, that was worth saving? You can find out about Limehouse China Town at the Museum of London, Docklands.